It’s that time of year where many of our clients are ensuring that all work for their garden is planned for. Much of your garden work will be possible for you to complete. This is not always the case for problem trees and problem hedges. It may be that they are too tall for you to reach safely. Or it may be that they have overgrown to a point that is a challenge for you to manage. A lot of our clients comment on the fact that they have not considered the waste created from such garden work. Once you start to prune trees and hedges, it soon becomes evident the sheer amount of green waste that is created. There is no way that your twice-monthly green bin collection can keep up with these requirements. Therefore, a problem in itself can be created. Total Tree Services are happy to help with all your problem trees and hedges. We offer free estimates and good advice. We are fully insured, and our staff are fully trained. This image shows work that we recently completed. We aim to make contact with us quick and easy. We are available anytime on via telephone on 07855 859983 or 0161 483 7816. You can contact us through Facebook or even through our contact form. We work hard to offer a service that exceeds your expectations. Our skilled staff are friendly and professional and will always go above and beyond to ensure that we offer the best-possible service. Have you got trees that you consider being a problem? Enquire today; our advice would be to try and plan ahead. We come to survey the work in order to offer a full and detailed quotations for the work due to be carried out. 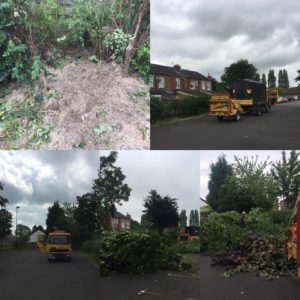 There are no hidden charges and we offer an open approach to all elements of our tree surgery work.